09-Jul-2009 -- The trip to 29S 138E by james, Jim, Len, and Tam Nagel. First, many thanks are due to the Mitchells of Muloorina, Oldfields of Clayton and Dunn family at Etadunna stations, for their patience and permission to cross those properties. I had been considering attempting this confluence for a couple of years since my first dalliance with the “DCP” in Indonesia, where I made a couple of attempts on and eventually succeeded in visiting 1N 118E. Careful study of Google Earth and various map sources, plus information from people who live and work in the area convinced me it was possible in just a few days from Adelaide. The trip in total followed a path of roughly 1650km through South Australia; from Adelaide, via Two Wells, Mallala, Balaklava, Blyth, Brinkworth, Yacka, Gulnare, Georgetown, Gladstone, Caltowie, Jamestown, Black Rock, Orroroo, Morchard (overnight), Orroroo, Carrieton, Cradock, Hawker, Leigh Creek, Lyndhurst, Marree, Muloorina (overnight), Etadunna, Dulkaninna, Clayton, Marree, Farina (overnight), Leigh Creek, Hawker, Cradock, Carrieton, Orroroo, Morchard (overnight), Orroroo, Pekina, Tarcowie, Appila, Laura, Crystal Brook, Snowtown, Port Wakefield, and back to Adelaide. So with a bit of planning and packing, the local winter school holidays allowing my sons Len and Tam to join me, and my father Jim being keen to join us on the drive, we set off from Adelaide in the late afternoon of 7th July, and made it about 60km before having to go back for the sat-phone we overlooked in the rush to leave in daylight. Finally organised, we struck out again and reached Morchard at about 10:30 pm. Wednesday 8th we re-packed the car and left Morchard about 09:00, fuelled up at Hawker around 10:00, bought another folding shovel as a charm to ward off getting bogged in the sand we knew was coming, lunched and re-fuelled again at Marree, and began the serious part of the journey. After driving 30km towards Muloorina station and its renowned campsite, a stone poked through the sidewall of the front left tyre and by the time we stopped it was destroyed. Going on without a spare would have been foolish in the extreme, so it was back to Marree for a replacement... we hoped. Lyle Oldfield at the Marree Roadhouse was happy to supply us with the only tyre of the correct size he had in stock and the next available would be two days by supply truck. After a quick rotation to move the worst tyre onto the spare hanger, we decided to keep going with the attempt. An hour later we pulled up at Muloorina waterhole and campsite at about 16:00 and settled in a vacant spot on the north side of the waterhole (29.23809S 137.90006E). It is a beautiful campsite, if heavily populated due to school holidays. The waterhole is fed by an artesian bore and the pool created grades from warm nearest the bore to eye-crossingly freezing where the water eventually disappears in the sandy creek bed. Paying our dues and leaving the Muloorina campsite on Thurs 9th at about 08:30, and with explicit permission obtained by phone in the weeks prior to the trip, we followed roads north through pastoral leases that stretched over what my father called ironstone plains on Muloorina and across the dry Clayton River before grading into sand dune country as we pressed north to Etadunna. Once on Etadunna, we followed a fence maintenance track towards Lake Eyre and 29S 138E, until eventually the track almost disappeared on a claypan between sandhills about 700m south west of the confluence. Not wanting to chance 10m dunes without a road or back up, we parked the car and took to foot with the trusty Garmin “Etrex” and bag of jelly-babies anticipating a celebration. The landscape near the confluence is dominated by linear dunes running generally north-south(ish) with swales up to several hundred metres wide. 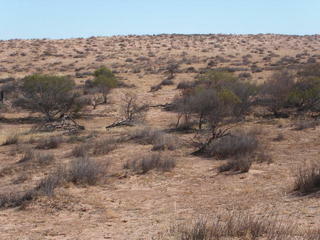 The bush is typical of this area in the Tirari desert with low acacia (wattle) trees, canegrass, annual grasses and occasional wildflowers scattered across the swales and the grasses and flowers having the dunes mostly to themselves. We strolled over two dunes following the Etrex, into a clump of low wattle trees and found the confluence at 10:40 about a metre south of a dead wattle and a couple metres west of a live one. Accuracy on the Etrex was showing as 3m and finding the spot for 5 zeros to appear on the WGS84 co-ordinates was no problem but it took several shots to get the Etrex into focus. After taking the requisite photos - North, East, South and West, Dad and my sons waved away a few flies, celebrated with a handful of jelly-babies and walked back to car to start the journey home via Georgia bore, Lake Florence and the Birdsville track. While walking back to the car we noted several patches of worked stone with scattered spear points, fine short blades and skin scrapers attesting to the fact we were not the first to walk over this area. During the trip back to the Birdsville track we moved through the middle of the Tirari desert, crossing so many dunes that we lost count at 50, stopping for lunch under a small lonely tree (28.85206oS, 138.21030oE), just east of Lake Florence and taking some photos of wildflowers before carrying on. After reaching the Birdsville Track we stopped at Etadunna, Dulkaninna and Clayton stations on the way south to pay our respects, let them know we were out and safe, and say thanks for their patience and tolerance. We looked around the excellent Clayton campground and as we saw a large number of cars come in behind us, and the artesian spa already having a waiting line, our keenness to get home led us to drive down to the Farina campground between Marree and Lyndhurst, losing a second tyre in the process to a slow leak and tread delamination (no spare left now). Overnighting at Farina with a fair crowd of fellow travellers was easy, as it is well appointed with good water and showers heated by a traditional Australian “donkey” arrangement of a large drum mounted over an open fire and insulated with masonry and earth. With no spare tyre left, we slowed down a little on the 10th, and with a raging tailwind, the run back south to home was relatively economical, although the dust storms the wind whipped up through the Flinders Ranges were terrible to see as soil and moisture were being stripped out of an already dry area. Again, i would like to extend our thanks to Muloorina, Clayton and Etadunna stations for their tolerance, advice and permission.